I want to be in on the next wave of lithium riches as the battle for control of this wonder substance kicks into high gear. And I also want to potentially turn every $1,000 invested into as much as $40,600 in profits. 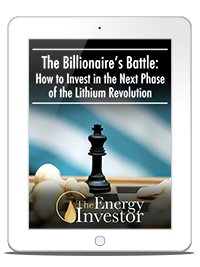 Please send me my free report, "The Billionaire’s Battle: How to Invest in the Next Phase of the Lithium Revolution," immediately. This report includes all the information I'll need for securing fast gains from three explosive lithium companies — all of which are poised to surge higher. But that's only the beginning of an array of benefits. Research Report No. 1: "How to Steal a Fortune From Trump's $1 Trillion Infrastructure Boom." Research Report No. 2: "Top 3 'Hidden' Energy Plays Fueling the Marijuana Boom." 12 Monthly Issues of Energy Investor: I'll receive every copy by email, quickly and efficiently. Real-Time Buy and Sell Alerts: In this fast-moving market, opportune buy and sell points can come at any time. Specific Entry, Exit, and Target Prices: I'll never have to guess whether a stock is a good buy or not. Keith will always give me specific entry points, sell prices, and realistic targets for his recommendations. Complete Research for Every Recommendation: I'll always know exactly why Keith recommends a stock. He does ALL the research and legwork and then sends me easy-to-understand instructions and insights, so I'll know exactly what to expect. This way, I'll be able to invest — and profit — with confidence. Live Customer Service: If I ever have any questions or concerns, I may call the customer support staff at any time with live help available Monday through Friday between 9:30 a.m. and 4:30 p.m. (ET). In addition, I'll also receive any new research reports published by the Energy Investor team in the future. I understand that I'll be getting my risk-free trial subscription to Energy Investor for a special discounted price of $99 per year. I'll have a full six months to decide if this type of research is right for me. And my special report and any other intelligence that I gather during this time will be mine to keep no matter what — even if I decide to cancel during my trial period.